I chanced upon this guide by Blue Mountain where it explains to us the correct way of viewing the EV / EBITDA. Specifically it discuss that people can use it wrongly. EBITDA gets a very poor name from famous investors such as Warren Buffett and SEth Klarman. The main idea is that you cannot just take it that you do not need to spend on intangibles and tangible maintenance to maintain the business, so as you can continue to earn profits. If you use it properly, it can be rather useful. 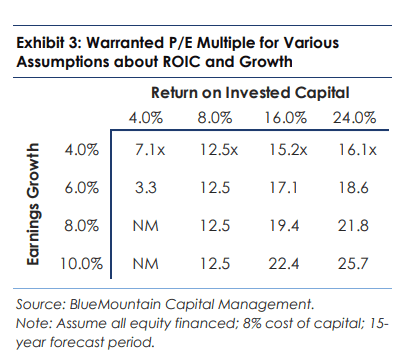 Blue Mountain shows us that while valuations are important, it has to be viewed in the context of How much return of capital (ROIC) over it weighted average cost of capital (WACC). If there is no excess over WACC, then no matter how high or low the growth a valid PE or EV/EBITDA multiple is likely to be low. Put it in another way, if the excess ROIC over WACC is low, increasing the growth rate would actually be to the detriment of the investor. The article also sought the explain the difference between using EV/EBITDA and PE. Since EV takes into consideration both the equity and the debt financing at this point, it does not hide the use of debt to boost results. EV, whether it is EV/EBITDA or EV/EBIT, is more preferred because it let us take into consideration the amount of leverage, thus i find that it is more conservative if we are taking a more conservative slant. EV/EBIT gives a better judge and perhaps is the basis of the Acquirer’s multiple. MP of Nee Soon GRC Robin Ng used to be the founder of Animal Concerns Research and Education Society (ACRES). In this On the Record interview, he answers some rather pointed questions about whether he has sold out, from being a former animal rights activist to joining the incumbent. However, there is a money slant to the interview. Well there are 2. The first one is on surviving on $500/mth. At ACRES, he started with earning $500/mth for a few years. His last drawn salary was $3460. This includes performance bonus, transport allowance, meal allowance so if you remove all those he earns $2,500. That is not a big sum of money. If you ask many, fresh graduates from NTU and NUS, they would feel marginalized to earn this sum of money. The difference is that he has now made it big. His MP allowance is $200,000. I have to confess that it has been sometime, since I live like that. That is perhaps my childhood. We do not have much, as Mr Ng was here, and perhaps because I do not have the responsibility to bring in the money, I did not feel the pressure. But I can see that having enough money reduces misery. Not having too much money, when you are contented is not so bad. Of course this is reflective happiness for both Mr Ng and myself. We do not remember the day to day that well, only traumatic or very joyful experience. If we do not have a lot of those, we think that not having a lot of money was OK. I can guarantee if we live through that period, there will be a few periods where we are not very happy. We just forgot about it. Joe Udo blogs at Retire by 40. He was a former Intel engineer who early retired. His wife was working but soon systematically followed him. In this post, he shared with us what happens when his mother rapidly succumbed to dementia. I think at Investment Moats, we do not tackle the topic of healthcare in early retirement enough but it has been on my mind. I haven’t put it out because I do not have enough materials on it, or am confidently talking about this subject. Joe shared with us how his mother’s mild cognitive impairment declined rapidly and came ever closer to dementia. In the article, he shared his family’s original early retirement plan in phases, how this plan has changed since then, and how the plan could change to accommodate his mother’s dementia. Generally, he admitted that his family didn’t think this could happen. I think for myself, I been thinking often about whether my dad would succumb to increase cognitive decline. And also how susceptible I would be to Alzheimer. Alzheimer, is now often referred to Type 3 diabetes. And a lot of the manifestation is due to insulin resistance and due to not sleeping well. The later which is still a challenging project for myself. So if I were to think about stopping work, you have to have some answer to Alzheimer and Dementia. Long term care cost is not cheap. However, I still think that building wealth is a good path to be on. Why is that? Whether you reach early retirement, or financial independence, if you did not reach that path, and you faced adversity, I can guarantee you, you are in a better position then if you have debt, or have zero savings to tackle these adversity. My friend Thomas wrote a short piece sharing with us his observation from the few hospitalization medical cost he encountered in his life. This one is helpful if you have always wanted to learn whether the cost of handling dialysis have come down a lot. His mother in law had a transplanted kidney and after 20 years, the kidney is past its use by date. I for one, never expected kidney to become serviceable after a period of time. Thomas’s experience with medical cost in hospital (B2) is that the bill has looked manageable. I think the most tough should be his mother’s experience struggling with cancer. My experience do mirror Thomas’s. But the dialysis cost can be substantial. I cannot remember what is the figures 10 or 20 years ago, but if you have relatives or friends who underwent dialysis years ago, you might be able to provide some color here. Coincidentally, one of my Telegram groups was discussing how expensive the shield plans and those comprehensive first dollar rider plans have gotten. The problem is that a lot of us are at a dilemma how do we optimize these healthcare costs, to balance with our other spending. I chanced upon this rather old article in the financial diet. A lady reach out to the writer to share her experience marrying into a wealthy family. I find that it is a story of an arranged marriage. At the start things was great because of the kind of money access she could get used to. However, over the next 20 years the relationship grew distant, and she repeatedly said she wanted to live him. Eventually she did, and because the husband family is so rich, she was at a severe disadvantage. So overnight, her financial situation, as well as her lifestyle changed dramatically. I asked her what advice she would give to a woman who dreams of being wealthy, but doesn’t think she could ever achieve it on her own. I would like to think women whose sole goal is to marry into a wealthy family would be more calculating and set aside money just in case. In this case, perhaps it proves that doing things like that is a hedge against a very possible betrayal from wealthy men. There is a Doubt in my head for years i was hoping to prick ur brains for ur views. Since the departure of money to gold standard way back in 1971, currency is being printed like nobody’s business worldwide. Especially during last financial crisis 2009 with all the massive QEs from all the central banks. Singapore’s Money supply over the years had also increased alot along with our Debts. I think Economies worldwide are fuelled by Debts & massive money printing. I have doubts on how long such a bubble (ponzi?) could sustain? Do u see a day of reckoning soon & debts worldwide will reach a level that could never be repaid & burst & massive recession (similar to the great depression in the 1930s) could take place? Now with afew EM countries on the verge of going bust from the liquidity crunch, higher interest rates ie: Argentina, venezuela, turkey etc, will these busts spread? Indonesia, Philippines, msia, vietnam seems vulnerable. Many countries are on Huge Debts compared to their GDP. Even SG is on massive Debts to GDP. Should we be worried in the years to come & if so what can we do? My leverage is quite high (quite alot of mortgages both in SG & Msia). The current escalation of Trade wars between US & China worries me. Should i liquidate most of my properties & debts? Which currency is better to hold? Or Gold? Any recommendations if things really go south what currency or assets are safest? Sorry for the long Q.
Hi eric, I would say, dont just look at the debt to GDP, which is like our debt to income ratio. Our own debt to income should not be more than 6 times. But for government it should be less. Generally, if you are 200% of GDP people gets worried. There is this guy called Richard Duncan who tends to be realistic but also presented some doomsday scenario. He actually think that USA is not having enough debt. If i remember his figures, the debt to GDP of USA is just 0.80% of GDP. And here is the problem, people look at the absolute figure and kept saying this is historically high and how are we going to clear it. but they failed to see it with respect to the total asset the country have. it is likely it is much larger. When you have some big problems, you can choose to austerity, you can hope people forgive your debt or you can inflate the debt out of it. OR something which a lot of people didn’t think of, to do a combination of the 3. Not many look at the quality of the asset. The USA do have a lot of debt but they also build up some serious technology and bio tech stuff that is monopolizing the business around the world. the GDP is going up perhaps due to this. now what about the emerging markets? we can say we are getting reckless. There might be an emerging market contagion due to debts priced in somewhat usd. and we may never know. we could see what happen 20 years ago happening. What i am trying to say is, gold standard is rigid… if you have a problem you only have austerity to work with. that is tough. it is sensible but you cannot get yourself out of it. now what we can see is, USA can increase the debt a lot, but how fast couild they take it out in this rate tightening phase? we shall see.